We hear you! 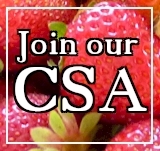 Some of our members have requested additional recipes to accompany their weekly produce share. We have begun the process of adding on a few more recipes to your weekly newsletter, and will now be posting them on our blog as well. We hope to be able to help you accommodate all the tastebuds in your family! Major kudos goes out to our lovely culinary artist Heather Logan with Kailyard Kitchen, who provides us her recipes from scratch, as well as beautiful photos each week. In addition to Heather’s recipes, I will be surfing my cookbooks, and the internet, to supplement members with additional ideas on how to utilize their produce. 1. Add the sliced shallots and 1/4 cup of oil to a small skillet set on low heat. Be sure to add them to the oil while still cold to prevent burning the shallots. Stirring constantly, cook the shallots until they are golden brown and crispy. With a slotted spoon, transfer the fried shallots to a paper towel-lined plate; set aside. 2. In a large skillet, combine sugar, fish sauce, tamarind paste, and water and stir over medium heat. Add the kale and jalapeño (if using) and saute until wilted. 3. Serve soft boiled eggs on a bed of kale over the rice. Top with fried shallots and fresh cilantro. Shave the cabbage with a sharp knife or mandoline so you have thin ribbons. Toss the cabbage, chives and cilantro in a large salad bowl. Steam the kale and purple sprouting broccoli. This will not only make them tender but also remove some of the bitterness. Place a large, heavy skillet over medium heat. Add bacon and cook, stirring frequently, until lightly browned, about 7 minutes. Remove bacon from pan with a slotted spoon and set aside. Add onion to the pan and cook until softened, about 5 minutes. Stir in apple. Meanwhile, cut off the stems of the chard and slice them thinly. Chop the leaves. Stir stems and leaves into the skillet along with the bacon, salt and pepper. Pour in 2 tablespoons water; cover the skillet and cook, stirring frequently, until chard is tender, about 8 more minutes.